Hilton cutting Diamond benefits in UK hotels? A couple of years ago I wrote about Hilton allowing UK hotels to downgrade the offerings in their executive lounges. It seems that the company is at it again. Hopefully not due to the huge influx of new Diamond status members from the current status match, Diamond benefits are being cut from 1st June. You will no longer be given a free drink voucher on arrival. The basket of goodies (sparkling and still water, nuts, sweets etc) will also be removed from your room. I have heard this from two separate HFP readers this week so, unfortunately, I have to assume it is correct. Stay at the InterContinental London O2 for as little as £104! 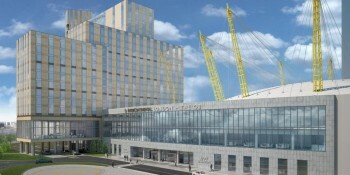 All being well, I should be checking out the brand new InterContinental at the O2 in London over the Bank Holiday. The hotel has been unbelievably obstructive to Head for Points but it takes more than that to put us off! Feedback to date is very positive after a wobbly first few weeks. However, the hotel is simply too big – 450 rooms – to fill when their is no major event on at the arena. For June, I am seeing rooms as low as £104 on Friday 17th June which is exceptional value for money. If you fancy an upmarket London break – and the hotel has a good pool, spa, rooftop bar and a well regarded executive lounge (at extra cost) – it is worth a look. You could also get some credit towards your Accelerate promotion targets at the same time. You can check pricing here. Finally, Lufthansa is offering a £15 discount on UK departures at the moment. You need to visit this website and claim a discount code. It will be valid for £15 off any UK departure booked before 22nd July. You need to travel before 31st October. Be interesting to see how the IHG compares. It is unclear whether this refers to ‘Hilton’ properties or the many other brands such as DoubleTree and Garden Inn etc. The benefits do vary considerable; see here http://hhonors3.hilton.com/en/explore/benefits/index.html. Last week I stayed at the Doubletree Sheffield Park for 10,000 points. It is an excellent hotel and on arrival I was handed a letter detailing the Diamond benefits which included 20% discount in the excellent restaurant which is not shown on the web site. We also stayed in an excellent few weeks old Hilton Garden Inn for 8000 points + £24 where I was asked whether I wanted the points or breakfast. I asked for breakfast and received both. My experience is that Hilton web site has a strong US bias e.g. enormous sign up bonuses on cards so is not always accurate for UK. Any changes were officially denied by Hilton on Flyertalk. She only denied any changes to my way benefits not the changes listed in this article. Changes to benefits that are not documented anywhere, though. Or are they? I wonder if it’s time to switch preferred hotel choice, I’ve always loved Hilton and average under 100€/night for most places (Conrad and Waldorf properties excluded). If Shangri-La had a better foot print in Europe and the US I’d use them all the time without a shadow of a doubt, well if work permits! I loved my recent stay in Hong Kong Island Shangri-La likewise Dubai and Paris were amazing too. Shame it’s harder to keep status from the UK. I’m there on Sunday, if your about give me a shout. Booked into a club room expecting a club intercon suite as a minimal. I’m solo for the evening if you need access to lounge let me know i can walk you in. Thanks. There is someone else there I know so I may sneak in to the lounge with that couple – need some photos! Say hi if you see me, pic on ‘Contact Us’. yeah mate ill give you a shout if i see you.. email me as per my details if you fail to get in. I see the letter came from the hilton Northampton. When I checked it late it was very evident that my room had been vacated only minutes before and that the departing occupants had just had a quick shower and ruffled the bed a bit. I asked to move rooms. The bathroom floor had wet footprints. Don’t they charge for parking as well despite being a single site hotel. They are number 1 on my dodgy hotels to avoid in the future list. I got charged for 1 small bottle of water that was in the room despite being diamond- it was put through a couple of days after the stay. Hilton now officially confirmed the removal of these benefits from hotels on flyertalk. The welcome gift is likely going although, as commented already in that thread and here, this was pretty patchy between properties and even between stays at the same property. They’ve also confirmed though that the more important MyWay benefits are remaining the same and bottles of water should therefore be fine too given they’re listed as a core benefit (welcome gifts were never listed at all). Seems a bit petty but it doesn’t look like a change to published benefits. … I’d have thought you would just settle for another case of Tescos “very drinkable” if they came with 1000 bonus cc points, no need to feed it or any mess to clean up. As a frequent Hilton resident (but not with Diamond status) I have been finding that Hiltons have been undergoing changes which are not for the best. Apart from sales they are routinely overpriced with the exception of some of the lower end Hiltons which can be good value for money. The benefits are being withdrawn and the executive lounge provision is now a poor shadow of its former self. Rob. Just checked into the HIlton Northampton which I use a lot. I can confirm that unfortunately the cut in diamond benefits is true. Only water now. No nuts, jellybean sir drinks voucher. That’ll help with the diet anyway! Nothing except water in Maidstone this week…I knew there was a reason that I didn’t like change!